Are you willing to give one day a month to help out the animals at the VHS? If so, we need YOU! 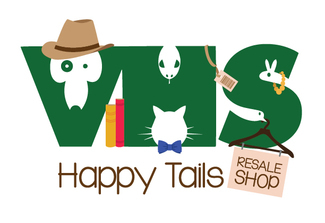 The VHS is excited to report that our Happy Tails Resale Shop has been an overwhelming success. The shop is run entirely by VHS volunteers and will now be open every Saturday. We need volunteers to work a shift in the store. The more volunteers we have to work the more money we can raise to help the animals. This is a great way to volunteer to help the VHS and all our animals WITHOUT having to be in the shelter seeing the homeless pets in our care or committing to a regular shift. The Prep Crew works during the week and will help with sorting through all the donations, cleaning, and merchandising. Team A works on Monday and Wednesday mornings from 9am - noon. Team B works some of the other days on a flexible schedule. All Prep days are currently filled. Please check back for future openings. The Sales Crew works on Saturdays assisting customers in the shop and taking in donations. There are 2 teams; Team A works the 1st and 3rd Saturdays of the month and Team B works the 2nd and 4th Saturdays (and sometimes the 5th). Unable to work in the shop? Then donate quality items! We accept clean, reusable items every Wednesday 9am - 2:30pm and Saturday 8:30am - 2:30pm. Your donated items are tax deductible to the extent of the law. We need volunteers to work and assist at the register, assist customers on the sales floor, and help take in donations. Dress in layers. The shop does have heat and air but its hard to regulate.